An Indian diamond trader has thrown a mass wedding ceremony for 111 fatherless women and given each one gifts worth thousands of dollars, saying giving a bride away was “sacred”. Mahesh Savani gave each woman a gift of 450,000 rupees. Photo: prabhu d boss. Mahesh Savani said the women, whose families were all too poor to finance their weddings, saw him as their foster father. 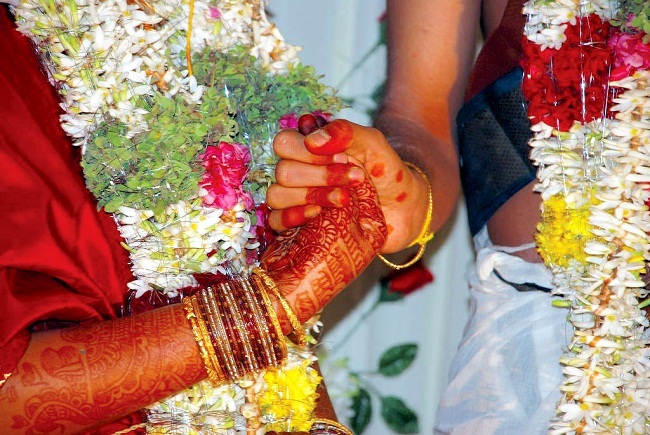 The 44-year-old said he had given each one gifts of gold and other items worth 450,000 rupees (US$7,250) to start their married lives, as well as paying for the wedding. “Material gifts are not important, but I have given my name to them and will fulfil all my responsibilities as a father of the bride for the rest of my life,” he said before the ceremony was held at a school in Gujarat state last Sunday (November 31). Savani, who has now organised the weddings of 251 women, said he began his charitable campaign in 2008 when one of his own staff members died. “I was very shocked when one of my employees died just 12 days before he could marry off his two daughters. It was very difficult for the family to arrange for marriage,” he said. It is not known how much the giant ceremony wedding cost, but Indian weddings are famous for their grand scale with multi-course feasts, decorated horses, brass bands and huge tents arranged to entertain hundreds or even thousands of guests.